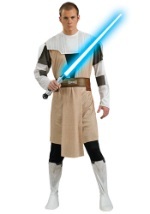 You’ll be ready to do batter with any Jedi master in our kids General Grievous costume! 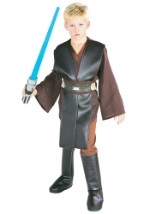 This exclusive Star Wars costume features a half character mask that is made from latex and secured with elastic and Velcro. It is highly detailed, including side panels that are made from durable plastic. The black, polyester jumpsuit has an attached red cape that is short in length (please note the cape is short and not long as pictured). Attached armor lines the shoulders, arm, chest and lower legs. The armor is grey with screen printed accents that mimic the appearance of General Grievous cybernetic body. The jumpsuit is also screen printed from the waist down for an authentic look and has a Velcro closure in the back. Don’t go into battle unprepared, be sure to get our General Grievous double bladed lightsaber weapon!